NEW YEAR GIFT – FREE BEST PREMIUM THEME | LIMITED TIME! Try demo now to experience this awesomeness and to explore more features in this theme. We are sure that you will fall in love with our Nik at first sight. This theme comes with 5 Preset Color Styles: Tomato, Organe, Cyan, Boocdo and Blue. Besides, it gives you the full control in customizing color schemes in the back-end. You can also totally change your color for all params: body, header, footer… by using c-Panel. Nik supports boxed and wide layout, with boxed version you can easily customize the background image and change settings to meet your idea. 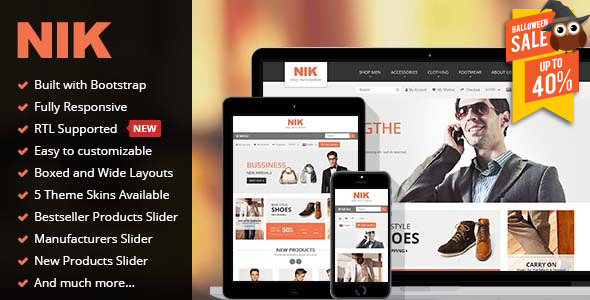 Nik is designed to be fully responsive. It will make your site have amazing look on different screen resolutions such as: mobile, iPhone, iPad and other tablets. With our mega menu, you can create a menu to display categories, products and add links to any page. It’s great for visitors that they can easily follow your website with keeping menu on top while scrolling function. This feature is to keep the website being fresh and easy structured for visitors following. The product listing is shown as a dynamic slider. 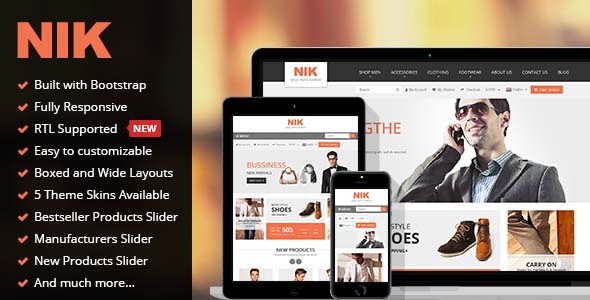 To give customers the best shopping experience, Nik is equipped with a wonderful hover action. An alternative product’s image will be displayed when users move the mouse over. Keep your users closer to your website with our Twitter Slider module supported. SP Nik allows to display a slider of Manufacturer Logos with SP Manufacturer Slider. Your website will look more professional with this special module just in minutes. This is an interesting feature for your Prestashop stores. It helps you to provide official information about store news, upcoming products and promotions to your customers.